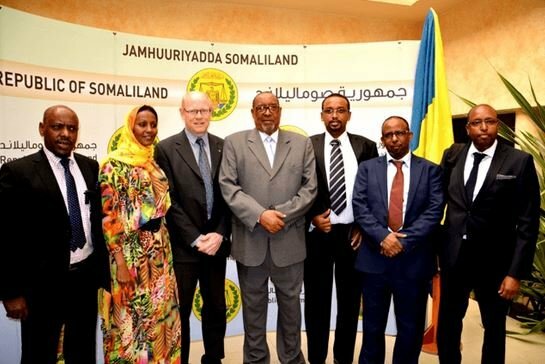 Somaliland strengthened ties with the Arab League and two delegations from Sweden and Turkey to develop the infrastructure of Somaliland’s capital, Hargeisa, and to kick-start economic and political cooperation. Hargeisa Mayor Abdirahman Mohamoud Aydid has received a delegation led by the Secretary General of the Municipality of Sweden's capital city, as the Chairman of Hargeisa local council disclosed his desire that Stockholm municipality will contribute their experience to the development and the beautification of Somaliland's capital city, Hargeisa. The mayor in his reception for the Swedish Delegation has been accompanied by the Secretary General of Hargeisa city, the Director General of Ministry of Information and National Guidance, General Manager of National Television and other government officials including members of House of Parliament. "It's an opportunity for us to have higher officials from Sweden's capital city, Stockholm and are led by the Secretary General of Stockholm Municipality and were accompanied by members from Somaliland Diaspora Community in here today. They came here in order to contribute their expertise and technical recommendations to the development activities which are running in the country and particularly to bring their experience on planning and developing cities and the infrastructures of Somaliland's cities including Hargeisa municipality." Said Abdirahman M. Aydid. The Mayor has thanked for the Diaspora members for establishing the cooperation, communication and collaboration between Stockholm and Hargeisa. Speaking about Hargeisa/Stockholm relations, the Mayor has noted, "I am welcoming the Secretary General of Stockholm for the Somaliland capital city, as we will arrange several meetings on creating close relations and links between the two cities (Hargeisa and Stockholm)." Secretary General of Hargeisa city Mowlid Waris speaking about the Swedish delegation who arrived in the country on Tuesday [6 January 2015] stated that there is a new era of relationship for both cities Hargeisa and Stockholm, and I am happy for that a new cooperation has been established. On the other side, Secretary General of Stockholm Mr. Lors Radh told that his delegation is happy to arrive in Somaliland's capital city, Hargeisa. I am highly contented that we have received an invitation from Somaliland capital city, as there have been a lot of other members who were interested in visiting to Hargeisa. He in the meantime, noted that acknowledged his gratitude to the mayor of Hargeisa, and the other members who have welcomed his delegation, and the Somaliland diaspora members who effectively facilitated his visit to Somaliland. The Speaker of Somaliland national Assembly Hon Abdurrahman Mohamed Abdullah “Cirro” currently touring the United Arab Emirates on Friday [9th January 2015] met with the Arab League official Mr. Ahmed Al Jarwani. The Secretary General of the Arab League Mr. Ahmed Al Jarwani received in his offices the speaker of Somaliland National Assembly, the two discussed matters of mutual interest including Somaliland history since 1960 to the present day. The speaker of Somaliland national Assembly Hon Abdurrahman Mohamed Abdullah discussed with Mr. Ahmed Al Jarwani issues pertaining Somaliland recognition and development during the meeting in Abu Dhabi, U.AE. Hon Cirro presented to the Arab League official Mr. Ahmed Al Jarwani Somaliland case and its quest for self-determination begin since it gained independence as an independent nation and to the times of the ill-fated, even though to date diplomatic recognition has not been achieved. Somaliland has its own constitution and has already held two presidential and three local government elections in what international observers termed as the most free and fair electoral process in the whole of Africa not to mention 97% of its people votes YES during the referendum held in 2001. Hon Cirro told the Arab League official that it is a high time the Arab League opened a new chapter with Somaliland which it has been waiting for a long time for the organization to see the facts on the ground. The President of the Republic H.E. Ahmed Mohammed Mohamud yesterday [9th January 2015] met with visiting dignitaries from both Sweden and Turkey. Speaking to the members of press in different briefings, the Foreign Minister Hon Mohammed Bihi Yonis said that the President had given the visiting Turkish investment prospectus delegation a brief history on recent commercial developments and investitures. He said that the state and the people of Somaliland welcomed the delegation warm heartedly and wished them well in their endeavours. He said that the government policy encourage foreign investments and was always at hand to help expedite the necessary. The Turkish group was led by entrepreneur Mohammed Tars who reciprocated the gesture with corresponding etiquette. He said that his group was happy that it had had a concrete grasp of and about Somaliland in their brief orientation. On the other hand the Stockholm city’s executive secretary said that his visit would help raise the awareness and interaction of both societies in both countries even more. He said that he looked forward to seeing more future meetings and the stepping up of Swedish visits. Hon Bihi said that after acknowledging the truthful and basic facts about and on SL, he hoped that the Swedish parliament would take SL cue and handle it the Palestinian way hence recognize this country. Present in both meetings at the state house were the ministers of Foreign Affairs, Interior, and Planning the Honoroubles M.B. Yonis, A.M. Waran-adde and S.A. Shire respectively and the private secretary of the President Mr. Ali Ahmed Ali. Present during the Swedish briefing was the Mayor Cllr. Abdirahman Aideed Soltelco and the City’s executive secretary Mr. Mawlid Waris Abdillahi.